Imagine searching for directions, listening to music on Pandora and Tweeting -- all while you're driving down the interstate. MyFord Touch, just unveiled at the Consumer Electronics Show, promises all of that -- and could change how we experience digital content while driving. "When you look at the mix of rich graphics and colors and the improved voice recognition and touch controls," said Jim Buczkowski, Ford's Director of Global Electrical and Electronics Systems Engineering, "it's a whole new experience and it's going to represent how you interface with your car in the future." The technology, which will be available in 2010 and 2011 models, is Ford Sync on steroids, according to one social media expert Jenn Van Grove. Drivers will be able to use voice commands and steering wheel controls to control applications on mobile phones -- so they won't have to use their hands to control the device. "We're finally seeing Internet connectivity come to our vehicles, so it's not just being able to connect to the web, it's being able to browse the web with multiple tabs," said Van Grove, associate editor with Mashable. "It's even turning our cars to a WiFi hotspot so our passengers can connect to the web as well." Imagine searching for directions, listening to Pandora and Tweeting all while you're driving down the interstate. MyFordTouch, just unveiled at the Consumer Electronics Show, promises to change how we experience digital content while driving. The system will allow the driver to tag songs by pushing a button on the radio display. When the ride is done, you’ll be able to sync the playlist of tagged songs to your iPod so you can buy them from the iTunes store. As for safety, the browser can only be used in park. It also has text-to-audio capabilities, so it can talk back to the driver. "With all the applications on iPhones and RIM devices, this is going to be an open API that many people can connect to when they write applications for mobile phones," Buczkowski. 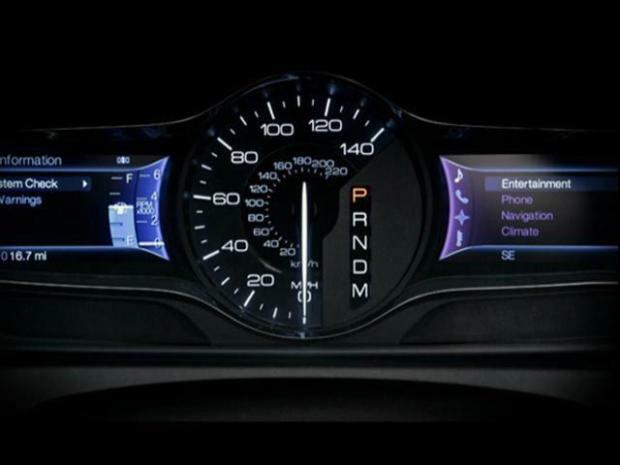 On the 2011 Lincoln MKX, Ford will launch MyLincoln Touch as one of eight features. The Touch system replaces traditional vehicle buttons, knobs and gauges with clear, crisp LCD screens and five-way buttons like those found on cell phones and MP3 players. The screens can be personalized to display information relevant to each individual driver using a simple button click, voice command or touch screen tap,” according to a company news release. Customers will see the system in cars on lots later this year.